Marine electrical propulsion systems have been utilised for many years providing cost efficient power with reduced environmental pollution. They provide main propulsion, power for manoeuvrability and supply to the ship service loads. Naval vessels, cruise liners, container vessels, offshore oil & gas vessels down to smaller research vessels. All benefit from an electrical propulsion system. 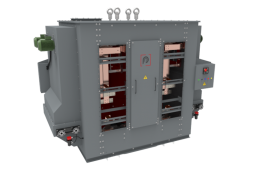 TMC Transformers can supply marine converter transformers, distribution transformers and reactors for all of the above applications and all custom designed to match specific project requirements. Typical network voltages can be 6.6kV or 11kV with more specialist vessels utilising voltages as high as 36kV. 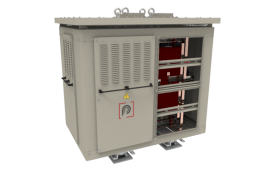 TMC Transformers can supply transformers to meet your exact project requirements in both cast resin and vacuum impregnated (VPI) construction. 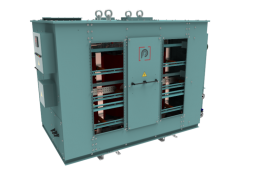 Protection from the harsh marine environmental can be provided by a closed circuit cooling system using non ventilated enclosures with protection classes of IP44-IP56 together with air to water heat exchangers (AFWF) to dissipate the losses. The electrical propulsion systems have many advantages compared to the conventional engine driven propulsion system. This technology is naturally increasing the demand for electrical propulsion for different vessels, like cruise ships, container ships and navy ships. With advancement in technology and research, the electrical propulsion system is not limited to small boats and small vessels anymore. On board of vessels there are a lot of electric engines. Usually a VSD and a customized converter transformer feed these motors. Drilling, thrusters, compressors, pumps, etc. are typically configured as described. MV transformers are almost always present on board of vessels, in particular on cruise ships.